The team at NASEF has found that esports is an incredible vehicle to help high school students grow in many aspects of their lives. Our technical advisors and advisory committee are comprised of some of the best minds in the fields of education, human development, psychology, engineering, information systems, and more. To provide opportunities for ALL students to use esports as a platform to acquire critical communication, collaboration, and problem-solving skills needed to thrive in work and in life. Download Our Parent's Guide to Esports! Resources for parents who want to speak to school administrators about allowing esports clubs on campus. News on video game research conducted by thought leaders within the field of neuroscience. Ways that parents can support their students academically and with extracurricular activities. Be sure to follow us on social media, as we’ll be regularly adding new content, articles, and resources! If there’s a question not answered within our website, please contact us at info@esportsfed.org. Don't forget to get to receive our weekly newsletter with the latest news and resources. Join our parents group on Facebook! Parents: wondering if there are really benefits to high school esports? Is it all hype? Thank you again to the Dang Vu family for sharing their story! 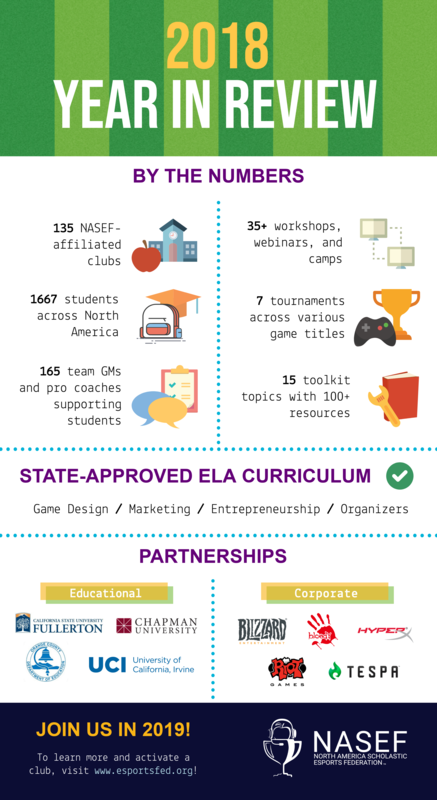 The North America Scholastic Esports Federation has more than 100 clubs across the country and is growing fast! Fantastic, you say! But, what are esports? Esports is a term derived from “electronic sports” and is essentially competition in video games at a very high level, similar to traditional sports. Esports titles vary from team-based games to individual games with each title assuming a certain genre. Genres vary from multiplayer online battle arenas (MOBA) to real-time strategy (RTS) and first-person shooters (FPS). To learn more, visit our blog on NASEF 101! Why should educators embrace esports? To learn more, visit our full blog on why educators should embrace esports! Are video games good for a developing brain? Yes! Dr. Constance Steinkuehler, Professor of Informatics at the University of California, Irvine, explains her findings in our interview below. How does NASEF use esports as a learning platform? NASEF has developed a research-based method to incorporate significant educational elements into league play of popular video games while maintaining an authentic gamers’ experience. Want to hear more? Be sure to download our #GametoGrow podcast! What do they do during an esports club meeting? Is it only playing games? NASEF's club model puts the students first, using the esports ecosystem (above) as a model to go beyond the players of the games. Through the club, students will receive the tools needed to use their interest in gaming as a way to improve on critical real world skills! "New educational opportunities arise as competitive mainstream video games and education continue to mix." "...the most resilient, adaptive and effective learning involves individual interest as well as social support to overcome adversity and provide recognition." "Through a new initiative in California, students can pursue their love of competitive gaming while developing career skills and fulfilling curriculum requirements." with you — that encourages people to stay in STEM.” This strategic move aims to provide kids with relatable role models in STEM fields." “We are going to be an example of how girls can play, and I definitely don’t want to let that up." "These are places where kids learn to negotiate conflict, become independent, and explore what kind of person they want to be." "Esports is a great way to prepare students for the increasingly digital world they live in, too. They learn how to apply lessons learned through gaming to real-life situations that require decision making, teamwork, and perseverance." How can your student participate? Can a “non-gamer” participate in their high school esports club? How do you activate an esports club? How does NASEF help an activated club?